I found several articles on the subject. Were there any legal consequences for the alleged killer? The incident was extensively covered in regular Swedish media. It seems undisputed that a Syrian 14 year old boy committed the crime, but there are conflicting reports about the background events leading up to the murder. The offender did not face criminal charges, since he was below the Swedish age of criminal responsibility (straffbarhetsåldern), which is set at 15. He was however sentenced to forced psychiatric care . Now - I don't know how valid any of these sources re, and I'm only reading the translated versions which leave much to be desired. But what it looks like from looking at both sides is that Syrian boy hit on or "tried to hug" (or so is the English translation) Lithuanian boy's sister. Lithuanian boy slapped him for it and someone videotaped it on their phone. The video got kinda locally famous and the Syrian boy felt bullied and ended up in the hospital. 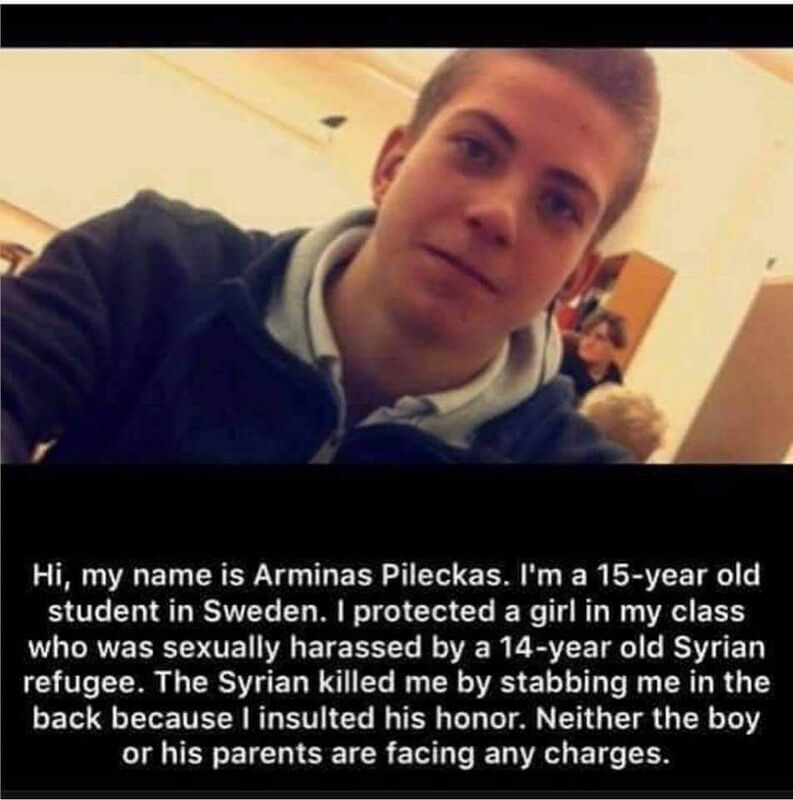 Then on 11 Jan my birthday, actually Syrian boy stabbed Lithuanian boy in the back during lunch break and hit him in the heart. And yes - kids committing crimes under certain ages get certain leeway around the world, but the alleged killer supposedly is in psychiatric kid's jail or whatever you want to call it. It's so hard to verify these types of articles because the English versions usually pop up in sensationalist alt-right websites like Breitbart, Russia Today, Independent, Telegraph, Daily Mail etc. which are not very reputable. Most all just link to each other and claim them to be true. The RT version of this story linked to the Lithuanian and Swedish sites I found, and when I look up those news sources in Wikipedia (peer-reviewed, non-biased as much as it is possible site https://en.wikipedia.org/wiki/Lrytas.lt), we see that the Lithuanian website was originally associated with the newspaper but branched off in 2006 and is owned by a private company with no Wikipedia entry. Hard to tell if it's a viable news source or not, but from clicking around it seems to be a more nationalistic, conservative publication. Checking out the Swedish source https://en.wikipedia.org/wiki/Aftonbladet we see that they are a sensationalist tabloid publication with anti-semetic and Russian propaganda criticisms. I'm gonna now try and find some official Swedish police blotters to verify names and see if in fact a Lithuanian kid was murdered by a Syrian kid, but it's really looking right now like it's a distortion of a half-truth (the video of some kid slapping another kid) and turning it into anti-migrant, alt-right propaganda - most likely pushed into existence by the Russian propaganda machine. Not the answer you're looking for? Browse other questions tagged law sweden . Do girls mature more quickly than boys?